The first of the many names God gives himself is Elohim. In the first sentence of the Bible, "In the beginning God created the heavens and the earth," the Hebrew word translated God is Elohim. I have read numerous translations or interpretations of Elohim: the Lord is my strength, the plural nature of the word Elohim for one God, the powerful one, it seems the discussion is endless...and perhaps justifiably so. The subjects of God, the nature of God, the word of God, etc. are endless, why should one of the names of God be any less so. And while I certainly do not intend to resolve any of the discussions mentioned above in this post, I do want to suggest another alternative (not necessarily in place of, but in addition to, all the above). As before, let's look at what the ancient Hebrew pictographs show us about the name Elohim. 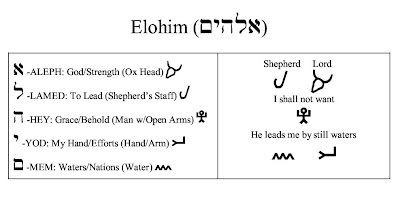 Elohim is spelled in Hebrew ALEPH (the first letter of the Hebrew alphabet, and similar to our letter "A")(in the ancient Hebrew pictographs, ALEPH is pictured as an ox head, and it signifies strength, or God - as in the Lord is my strength). LAMED (L)(pictured as a shepherd's staff, meaning to shepherd or lead). HEY (H)(pictured as a man with outstretched or open arms, meaning God's grace or to behold). YOD (Y)(pictured as the arm from the fist to the elbow, meaning my hand or works). MEM (M)(pictured as waves of water, meaning waters or peoples/nations). In other words, the LORD is my SHEPHERD by his GRACE he provides for MY needs (I SHALL NOT WANT), he takes me by MY HAND and LEADS me by still WATERS. Sounding familiar? That's right, Psalm 23. So, while the Lord is definitely our strength, I think He primarily wants to be our shepherd.